Your Darth Vader toddler will step out in style with this black, polyester/flannel romper which snaps on the back and between the leg. The cape and hood are detachable for easy wear and cleaning. 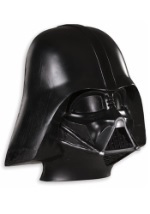 Venture out and about in the galaxy in this fun Darth Vader toddler costume.